Sammi Cheng is Wang Qiyao in Stanley Kwan's Everlasting Regret. The Skinny: Sammi Cheng strains her acting chops aTony Leung Ka-Faidmirably for Everlasting Regret, and while her effort is appreciated, the film comes up disappointingly short. Stanley Kwan's film seems to recite rather than reveal the inner workings of Wang Anyi's famed novel Changhen Ge, and the result is a gorgeous, but frustratingly distant affair. Director Stanley Kwan attempts to mold Sammi Cheng into a Maggie Cheung-type actress with Everlasting Regret, a film adaptation of Wang Anyi's popular and influential novel Changhen Ge. Cheng is Wang Qiyao, a young student in Shanghai whose simple beauty impresses photographer Mr. Cheng (Tony Leung Ka-Fai), who suggests that Qiyao enter a beauty contest. Qiyao wins 2nd runner up, and promptly catches the eye of Councilor Li (Hu Jun), a Nationalist official who makes Qiyao his mistress, and even furnishes her with a sumptuous Shanghai flat. But times in Shanghai - and larger China - are changing quickly, and Councilor Li is but the first of many men to make their mark on Qiyao's life. For a Chinese woman living in an increasingly rigid society, Qiyao's sordid past becomes a millstone, and yet she struggles to rise above it. Can she? And is a workable movie made of her struggle? The answer to the first question is: no, she can't rise above it. Despite clinging to her dignity, Qiyao is ultimately drawn into one negative relationship after the next, and her final fate is as oddly fitting as it is distressingly tragic. The second question is far more complex, but unfortunately, the answer also seems to be no. Everlasting Regret made news before its Venice Film Festival debut because it had to be trimmed to appease Chinese censors, and the film definitely seems to be missing something. Gone are overt references to the rise of Communism and the impact of the Cultural Revolution, and the viewer has to make all connections between Qiyao's life and the changing times in Shanghai without help from the actual film. The conceit is a tough one, as only those familiar with the original novel will get the exact timeline, while those with working knowledge of modern Chinese history will only be partially aided (reviewer note: I fall into this category). Those without any knowledge of the life and times of Shanghai will be totally in the dark, and Wang Qiyao's story may end up meaning absolutely nothing to them. That said, it's questionable if Kwan ever did assemble enough material to make a complete adaptation of the novel. Everlasting Regret is epic in scope, and attempts to squeeze in plenty of story in under two hours time. Too frequently we're introduced to a new man in Qiyao's life, only to find him in bed with her next, and out of the picture shortly thereafter. After Councilor Li disappears following the rise of Communism, Qiyao takes up with Ming (a dubbed Daniel Wu), the rich son of a Shanghai businessman. Ming impregnates Qiyao, but is gone within twenty or so minutes after we learn that he's too irresponsible and/or immature to marry her. The pattern continues with Qiyao's husband, a sickly gentleman Qiyao marries only to secure a father for her child, and with Kela (Huang Jue), a younger man who is introduced to Qiyao after her daughter has grown into adulthood. All the while, Qiyao struggles with a difficult life reflected in Shanghai's changes, but the film flickers by too quickly to register the changes emotionally. We certainly get what's happening to Qiyao, but the significance of the events is muted by the omitted (read: political and historical) information. Which brings us to the most difficult topic: Sammi Cheng's acting. Cheng's role in Everlasting Regret is an incredible departure from her signature romantic comedy heroines, and local media attention has been largely focused on the success or failure of her work here. Unfortunately, the role seems to be slightly beyond Cheng's range, and for the most part she seems distant and uncomfortable. On one level it's hard to fault Cheng, as the film's emotional distance is created not only through her performance, but also through a number of filmmaking choices. One is the noticeable omission of explicit historical detail, but the other is Kwan's choice to tell Wang Qiyao's story from Mr. Cheng's perspective. Everlasting Regret is narrated by Tony Leung Ka-Fai's character, which is odd because he's not there all the time, and his perspective is ultimately one of distant and impossible affection. Presumably he can see into Qiyao's core in a way that the audience can't, but the film itself doesn't back him up. Qiyao herself is a frustrating character that's hard for the audience to warm to. She may be steadfast in maintaining her dignity, but ultimately she seems like a passive witness to the men who come and go in her life. She clings to them emotionally, but the relationships are barely explored and her emotion barely felt. Cheng appears shut off for a good portion of the film, and her impure Mandarin doesn't help much. Only on occasion do we see into Qiyao's core, such as in a head-banging crying fit that's terrifying and effective in its emotional shock value. Cheng also excels at some quiet moments of acting - in particular one sequence where she halfheartedly comforts her sickly husband while Mr. Cheng looks on - but most of the time she simply appears to be staring uncomfortably into the distance. The disconnected story only makes matters worse; most of the time, it's as if we're separated from Sammi Cheng and Wang Qiyao by a layer of thick glass. Everlasting Regret certainly possesses its positives. Some of the supporting performances are remarkably felt, especially from Tony Leung Ka-Fai as Mr. Cheng, and Mainland actress Su Yan as Qiyao's childhood friend Lili. There's also a rich, and all-too short peek into Shanghai's past glamour and decadence, and Stanley Kwan and William Cheung Suk-Ping (art director/editor/Wong Kar-Wai buddy extraordinaire) work overtime to make the film look and sound beautiful. 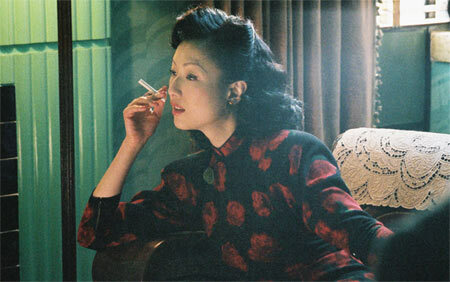 The filmmakers take great pains to represent thirty-four years of Shanghai through exacting period detail and intimate interiors, and their effort is appreciable. Also appreciable is the effort by Sammi Cheng, who departs greatly from her girl-next-door roles to take on a film guaranteed to piss off the vast majority of her fanbase. Sadly, neither Cheng nor the filmmakers can convince us that Wang Qiyao is a character worth watching for two hours of our time. For this movie, that's a big problem.